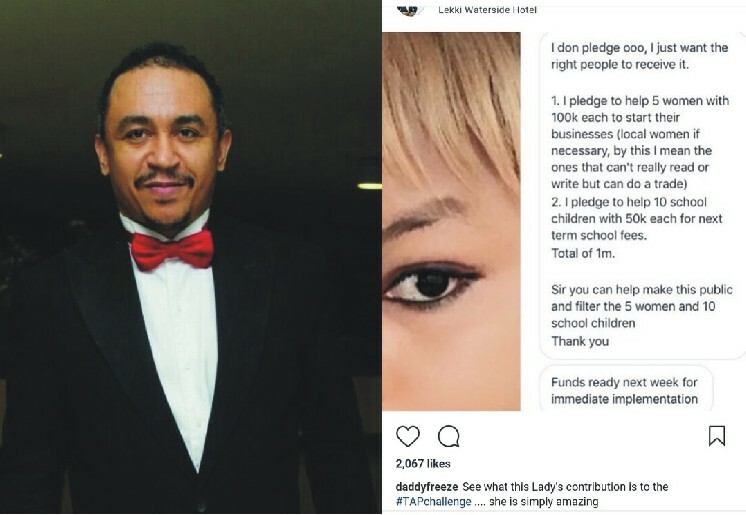 On Air Personality, OAP Daddy Freeze in all his critics and "anti-Nigeria Pastorship" nature has created something out of the ordinary that will undoubtedly benefit every Nigerian, home or abroad. He termed it Tithe Against Poverty (TAP) and the hashtag #TitheAgainstPoverty has been trending for days now. Tithe Against Poverty is basically a medium or an initiative were people of considerable wealth or everybody brings out the 10% tithe which they are suppose to go to church and pay as tithe to those who clearly don't need it (Nigeria pastors that a flying private jet and building universities that their own congregation cannot afford), to people who are really poor and needs the money. Knowing how Nigerians are "very benevolent in nature" many people have seen reasons with Daddy Freeze and they are parting with their 10% tithe and giving it to people who really need it. Someone just donated upto One Million Naira to help five women and 10 children. For all the nonsense attributed to Freeze, I think this project is a no brainer. I myself would rather part with my 10% and give it to people that needs it (the poor and needy) than give it to some people that are flying private jets and paying $10,000 (Ten Thousand Dollars) everyday as a parking space fees for the jets. Anyway, I call on all Nigerians to join this initiative so that we can help eradicate poverty from this wonderful country. Even if your 10% is 100, don't be shy to bring it. Imagine when only one million people bring N100 as tithe for this initiative, my friend; its 100,000,000 (Hundred Million Naira) in aide to give to people. And we have over 160 million people in Nigeria. So don't be shy. When am hungry, you gave me food. When am naked, you clothed me. When I don't have shelter, you gave me a place to stay.